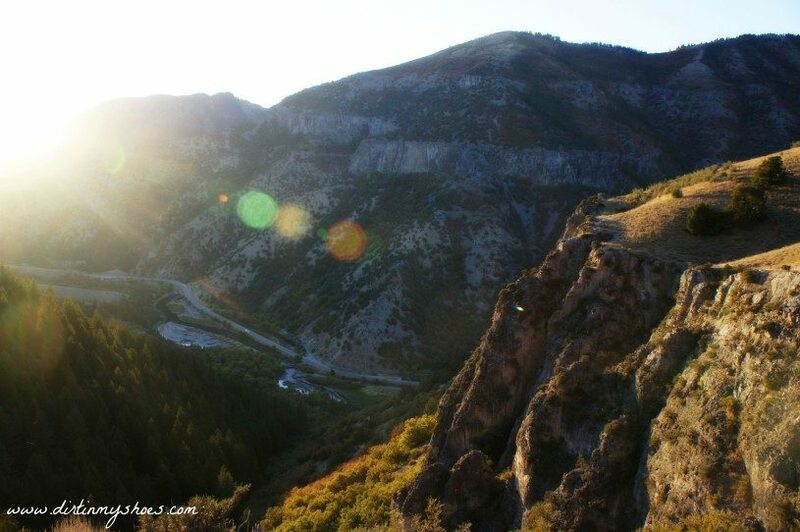 Today I’m heading up to northern Utah to spotlight a favorite hike of mine, the stunning Crimson Trail in Logan Canyon! This spectacular trail climbs to the top of the China Wall and provides incredible views of the canyon and the river below. This hike occasionally gets uncomfortably close to the edge of the beautiful sheer cliffs that can be seen from the road, making this trail a great adventure and one that you can look back on later and say “wow, I was standing on top of that”! The Crimson Trail was named after the “Senior Walk” that was completed by each graduating class of the local Brigham Young College in Logan. Although the College closed down in 1926, the trail was named the Crimson Trail because the school’s colors were crimson and gold. This trail is still a favorite among local college students and members of the community because of its close proximity to town and to Utah State University. The town of Logan, the Crimson Trail, and Utah State University represent an important time of life for John and I. We both attended and graduated from Utah State…GO AGGIES!!! We met on a blind date in Logan just weeks before I moved to Alaska for my job as a Park Ranger at Glacier Bay, and we spent our first few married years living just steps away from the gorgeous Logan Canyon and the Crimson Trail. We love this area and know that you will too! The Logan area of Utah has famously cold and snowy winters that sometimes seem to last forever! The Crimson Trail is a great trail, not only because it offers stunning views of the canyon and the river below, but because it is located near the mouth of Logan Canyon. Because of its lower elevation than many other trails in the area, this trail is often accessible in late spring. The Crimson Trail begins at the Spring Hollow Campground, where the parking lot is quite small and can fill up quickly (especially on weekends). From the parking lot, you will walk along the road until you pass the group campsites. Following the river, you will then be taken over a bridge where you will reach a fork in the trail. On my first hike up the Crimson Trail, there was no sign at the fork! A sign should point the way, but if not, be sure to take a left at the fork to start heading up the switchbacks. You don’t have much time to warm up your muscles before starting your uphill climb. In fact, the steepest parts of the trail are at the very beginning. Pace yourself, drink plenty of water, and rest as needed. When I’m tired, I always like to stop and take pictures…it’s the perfect excuse! Keep your eye out for rattlesnakes along the trail. We saw one as we were hiking! After hiking up the switchbacks, the Crimson Trail will flatten out as you trek along the top of the China Wall. The China Wall is a rock formation that is visible through most of the lower section of Logan Canyon and is characterized by steep cliffs of layered rock, making it appear as if it is a man-made wall. The views from the China Wall are absolutely stunning. We hit the top of the trail as the sun was going down, which colored a vibrant hue of gold over everything. The Crimson Trail travels along the top of the China Wall for several miles, providing gorgeous and spectacular views along the way! This part of the trail is relatively flat (a welcome change from the switchbacks). Not much shade is available along this section of trail, but the vistas more than make up for the lack of shade. Several sections of the trail come uncomfortably close to the edge of the China Wall, which is part of the excitement of the Crimson Trail! Be cautious, especially if you have young kids or pets that you brought along for the adventure. Take in the views of the canyon floor one last time before beginning your descent. The trail on this side is quite steep in a few sections, so take it slow and carefully watch your footing. As you come off the trail and meet up with the river, take a left and follow the River Walk back to the parking area. The autumn colors in this area are spectacular! This trail is perfect for a late-September, early October hike through vibrant leaves colored red, yellow, and orange. The Crimson Trail is a moderate 4.3 mile loop with a little over 1,000 feet of elevation gain. From Logan, travel east on US-89/400 N. This road will take you past Utah State University on your left and straight to the mouth of Logan Canyon. From the mouth of the canyon, drive for approximately 4.3 miles until you reach the Spring Hollow Campground on your right. Turn here and park in the small parking lot just after you cross the bridge over the river. The Crimson Trail begins above the group reservation sites. What is your favorite part of the Crimson Trail? Let me know in the comments below! It really is a great hike! How many hours does it takes round trip.And it moderate /easy/challenge/hard?thank you.